New York, USA - Like private homes and commercial buildings, houses of worship occasionally take on updates and restoration. The Cathedral of the Immaculate Conception had in the basement a collection of no longer used items from the church, social rooms, rectories and class rooms. The Cathedral, located in the Northern Liberties district in Philadelphia, was erected in 1966. The building replaced the old Cathedral Church at that time. Inside and out the Cathedral is gorgeous but as they are completing ongoing interior embellishments items will be replaced and the church is happily dedicated to reuse. The large gold displays have 102 small holders in the center and 20 large holders on the sides and across the top. In the center of the top is an electrified light socket under the cap and cross. They measure 65 inches wide and 21.5 deep and have small casters. We have 2 of these. They do not include glass votive inserts or candles. 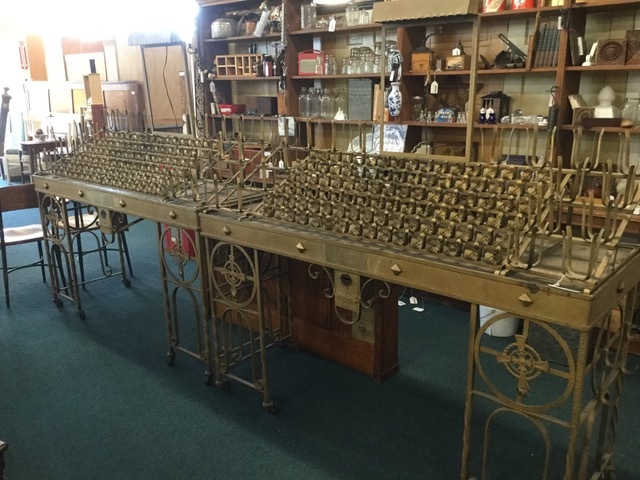 The one smaller iron display has 40 small holders and 5 large ones across the back. The base is twisted and scrolled wrought iron. There is a slot for donations on the front. The total dimensions for this smaller one are 28.25 inches wide by 44 inches high and 15.5 inches deep. I hear you, you are not a Church, so what the heck would you do with a piece like this. No worries. We have some ideas. They could be repurposed into a wine rack. cups for craft supplies or a bird feeder. Or how about this one? Take the top section off. Put the candle holder in your unused or faux fireplace and partially fill it with candles. Now it looks like you have a blazing fire. You can use the base as an aquarium stand, plant stand, or garden art. Can you imagine dozens of tiny herbs growing in them? A few short pews that are 54 inches long. The back is 32 inches high, the seat is 17 inches off the floor in the front. Several have kneelers attached but they can be removed. Stained and varnished oak. They are a nice size for a front entry or mud room where people are taking shoes on and off. A Holy water 'urn' with a stainless steel upper canister marked HOLY WATER on the top handle and an aluminum legged base. It stands 45 inches high and exceptionally clean and unmarred. This could have many reuse options and with no disrespect intended to its original use. Lemonade? Next up is the front row pew. Paneled sections in varnished oak with capped ends, kneeler and Bible holder on back side. Front side is also beautiful paneled wood, no seats. 8 foot 1 inch long by 38 inches tall at end cap. The Cathedral housed a school for many years so we also have several chairs that have an arm with a tablet table, all right handed. 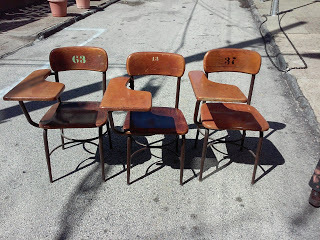 Some seats have numbers stenciled on the back, and the traditional school desk carvings. Wood is varnished and frames are sturdy metal. 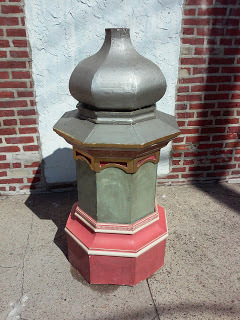 Another interesting piece is an 49 inches tall octagon cupola or dome. Brilliant and metallic colors, beautifully painted, tiered with an onion top that may have been the base for a cross. It is quite a stunning piece. Assorted tall metal candle holders originally used in the main sanctuary. Very sturdy. Could be spray painted in new more inspiring colors. They would also make great bird bath stands. 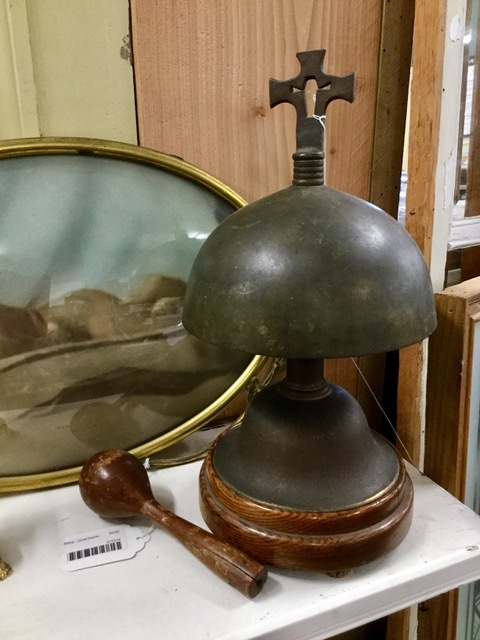 A special find is the bell gong from the church. This was used during special services and events. Made of bronze it has a sacred sounding tone when rapped with the wooden mallet. The team would like to take the opportunity to the community at the Cathedral for offering these materials to Restore of Philadelphia. Let us now give them new life!